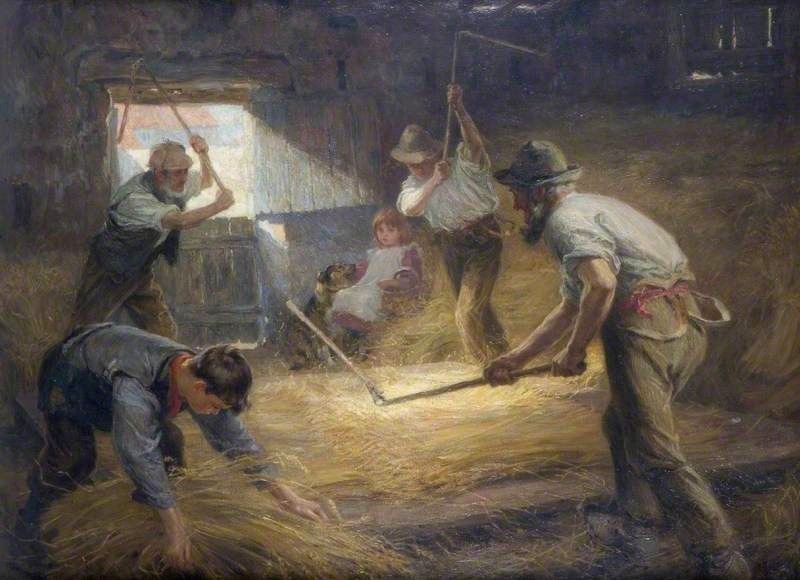 The Threshing Floor, by Ralph Hedley (1848-1913). First exhibited at the Royal Academy 1898 (see "Painting, Drawing and Print Database"). Oil on canvas, 121.3 x 161cm. Courtesy of the Laing Art Gallery, Newcastle. This is a lovely scene focussing on three farmhands of different ages doing the hard work of threshing with their angled implements. Two have loosened their braces, while the third wears a waistcoat, also undone. In the left foreground is a fourth figure, a boy stooping to gather some more of the newly harvested grain to place on the threshing floor. At the back, in the centre, sits a little girl in a pink dress with a white smock, watching the men. She has a basket on one arm, perhaps with their lunch, and a dog sitting beside her and watching her. She may be the sister of the boy in the foreground, and the daughter of one of the men, and / or the grandchild of another. Light streams through the top of the outhouse door, pooling at the angle of one of the threshing tools. Like the shaft of light, the angles of arms and tools cut across the horizontals, and stave off sentimentality in what could otherwise be a scene bathed in simple nostalgia. Picturesque the work may be, but it was hard, men's work. — Jacqueline Banerjee. Ralph Hedley Archive. Web. 23 July 2015.